Haven't done one of these links posts in a while, so I figure today's a good day for it, since there's some interesting news coming out of the FCBD weekend. --First and foremost, X-Men Origins: Wolverine, despite mixed reactions from fans, raked in over $85 million in the U.S. and collected another $73 million overseas, according to Box Office Mojo. A pretty good way to start off the summer movie season. Additionally, the Wolverine movie tie-in video game came out on Friday, and got a great review over at Newsarama. You can check it out here. --Next up is an interesting new App for your iPhone. 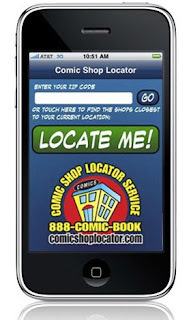 Last week, Diamond Comics released the Comic Shop Locator App through iTunes. If you're familiar with the Comic Shop Locator Web site, you'll have a pretty good idea as to how the new App works. The Locator Web site, which you can find here, allows users to find comic shops in their area. All you have to do is type in your Zip code and the site displays a list of shops close to you. As you can probably discern without the help of Professor X-like mutant powers, the App does pretty much the same thing. Only, in addition to giving you different stores in your area with address and phone number, you can get turn-by-turn directions to the store through the iPhone's Maps program. I downloaded the App yesterday, and while it displays one store that's in...um...Texas...whereas I'm on the East Coast, the other stores listed are correct. And the directions feature is pretty cool, and certainly very convenient. You can check out the PR blurb on the App here, and you can download in the App Store over at iTunes. So, if you have an iPhone, consider downloading it--the App is free, and you can't beat that. --And here's an item I should have mentioned a few weeks ago. Comics writer and novelist Peter David has started up his blog at a new location, and you can check that out right here. --Another blog shout out to the guys and gals over at The Savage Critics, which is the home base for Tilting at Windmills author and columnist Brian Hibbs. There's always interesting conversation and reviews and things over at Savage, so check it out right here. --And finally today, we'll end on a serious note. Sadly, comics artist Josh Medors was diagnosed with a terminal form of cancer over a year ago and he has recently taken a turn for the worst. If you have a moment, please do read this announcement, which was posted to Comic Book Resources this morning and talks about an upcoming benefit auction being held for Medors to help him offset some of the costs of an alternative treatment he is currently seeking. The auction will begin on Saturday, May 23, and will feature original comic art from a wide variety of creators. Take a look, maybe there's something that catches your eye. And that's all for today. We'll be back tomorrow with this week's edition of Waiting for Wednesday.